Belen Jesuit sophomore Javier Vento, right, and freshman Adam Magoulas, left, placed first and second in the 5K run at the Class 3A state boys cross-country championships to lead the school to its 10th state championship. MIAMI | Belen Jesuit always preaches running together as a team, but a youth movement greeted the Wolverines this year, as Javier Vento and Adam Magoulas led the way to their 10th state championship. Belen Jesuit’s 10th title tied Largo for most in state history. Belen Jesuit coach Frankie Ruiz, in his 17th season, credits the continuity, depth and camaraderie of his program for that success. He said this year’s 50-runner roster is the largest team he’s coached, creating challenges of traveling with that many. But it paid off. Just like last year, when the Wolverines won with only one senior, youth rose to the top with sophomore Javier Vento and freshman Magoulas leading the way. Vento won the race with a 15-minute, 39.98-second time over the 5-kilometer (3.1-mile course), with Magoulas second in 15:41.99. Belen Jesuit senior Giancarlo Benitez, who placed 19th in the 5K run at the Class 3A state boys cross-country championships, is considering running in college. Vento became Belen Jesuit’s fifth individual champion by edging out Magoulas and Seffner Armwood’s Jake Turner. Vento is Belen Jesuit’s first individual state champion since Elliot Clemente won the 2011 3A title. Only Tallahassee Leon (nine), Jacksonville Bishop Kenny (eight) and Longwood Lyman (six) have more individual champions. Ruiz said Vento had hidden in the lead pack behind Magoulas and Turner. But when Magoulas and Turner broke free with 300 meters left, Vento joined the duel. He said he and Vento had a plan to stay with the lead pack until about the 2.9-mile mark, which was the base of a big hill. The two Wolverines climbed with the lead pack, then broke loose at the top of the hill with Turner following. 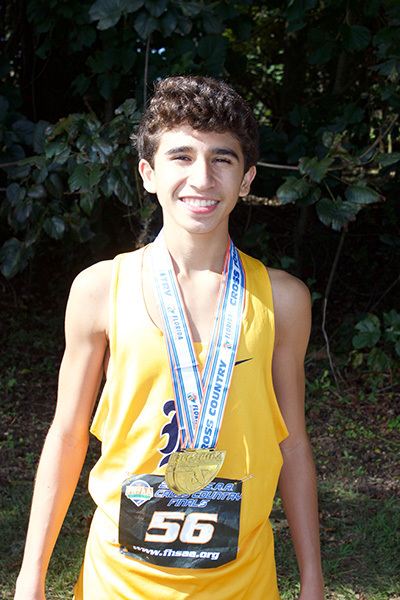 Belen Jesuit sophomore Javier Vento placed first in the 5K run at the Class 3A state boys cross-country championships to lead the school to its 10th state championship. He is Belen's fifth individual champion. Ruiz said this season Vento climbed from outside the top 7 last year. He said Vento had a great track season but had to overcome an injury to his sacroiliac joint (SI) – a joint that according to Vento connects the lower back to the glutes; the injury was aggravated every step. Vento said he took two weeks off to heal. Then he worked twice as hard to catch up with his teammates, and he maintained that work ethic once he caught them. Belen won this championship by getting all five scoring runners ahead of Chiles’ leader. All the returning Wolverines also improved their time over last year. Senior Lucas de la Hoz finished 10th overall with 16:14.59, with sophomore Diego Gomez 11th in 16:16.96. Senior Sebastian Roa closed out the scoring, finishing 17th in 16:24.61, just head of Chiles leader Connor Phillips. Belen Jesuit seniors Giancarlo Benitez and Cesar Aguzzi were 19th and 20th. Ruiz said that one sign of his seniors’ progress is that they’re talking about running cross country for college teams. He credited his team’s improved times to the Wolverines’ increase in workouts, camaraderie and depth. He said they trained together all season. That unity played itself out in the race, when at the first mile of the course the entire team was within eight seconds of each other. Vento said the Wolverines ran in three strong packs throughout the race. Ruiz said the entire team finished within 45 seconds – or within eyesight – of each other. “That slammed the door shut to other teams,” he said. 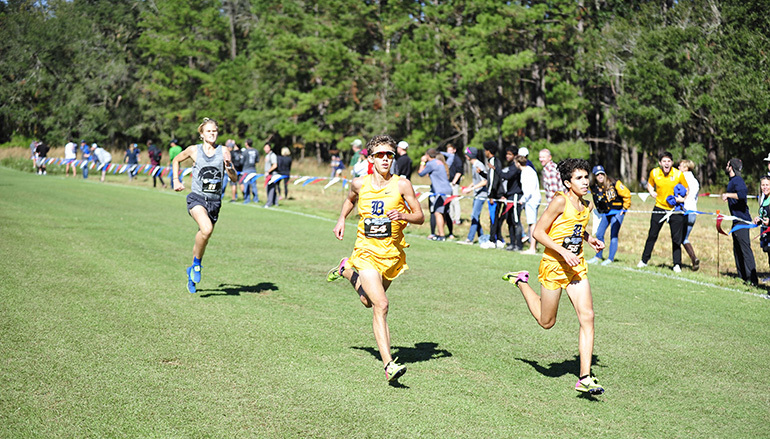 Belen Jesuit’s runners further tested how far they’ve come at the Nike Cross Country Regionals in Cary, North Carolina, Nov. 24. 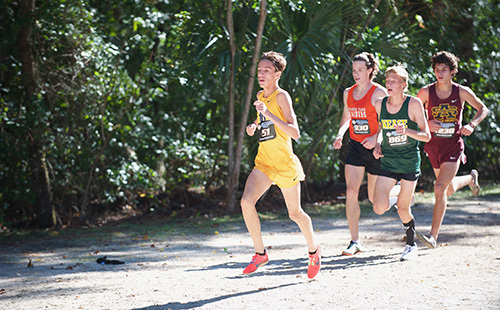 Although they did not place high enough as a team to advance to the Nike Cross Country Nationals in Portland, Oregon – only the top two teams advance – they did take fifth place. Magoulas finished 13th overall in the championship final in 15:34.2. Vento finished in the top 40 in 15:56.4. Sophomore Michael Sanchez grabbed a victory in the Rising Stars race in 16:40.1, while teammate Aiden Villasuso was 12th in 17:23.2. Then there’s next year – that potential 11th title in the 57th year of the school. Dec. 3, 2018: This article has been updated with individual times and results from the Nike Cross Country Regionals in North Carolina. Belen Jesuit's cross-country team, coached by Frankie Ruiz, won its 10th state championship, repeating last year's feat and tying with Largo for the most championships in state history.